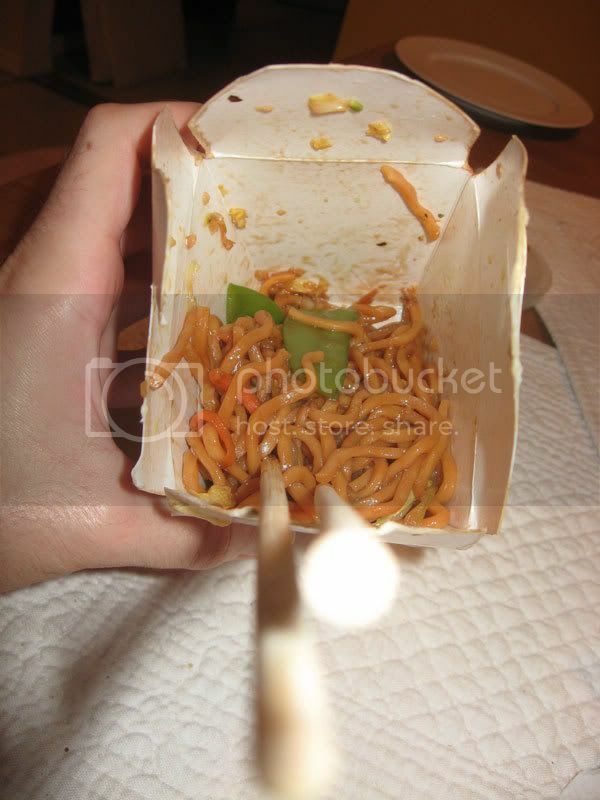 I returned to China Wok III in Sanford, FL and ate Vegetable Lo-Mein and Wonton Soup. 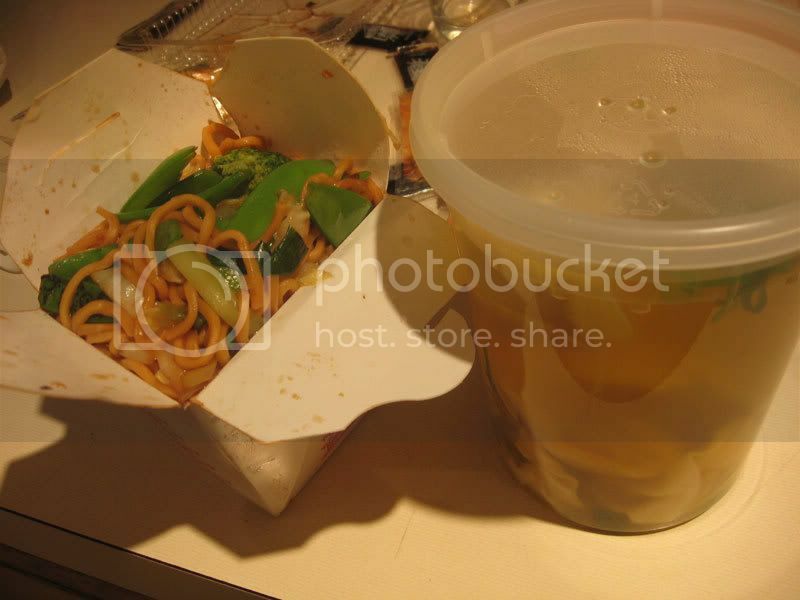 The lo-mein was filled with broccoli, snow peas, scallions, carrots, onions, and more. Everything was tasty leaving me with no complaints about my dining experience. The restaurant had signs all over telling their customers to vote them as one of theTop 100 Chinese Restaurants. I would have voted for them since they asked, but that website wasn't very user friendly. Besides from the '404 File not Found' errors that I kept on getting, I couldn't find any place to vote for the restaurant. Sorry China Wok III. 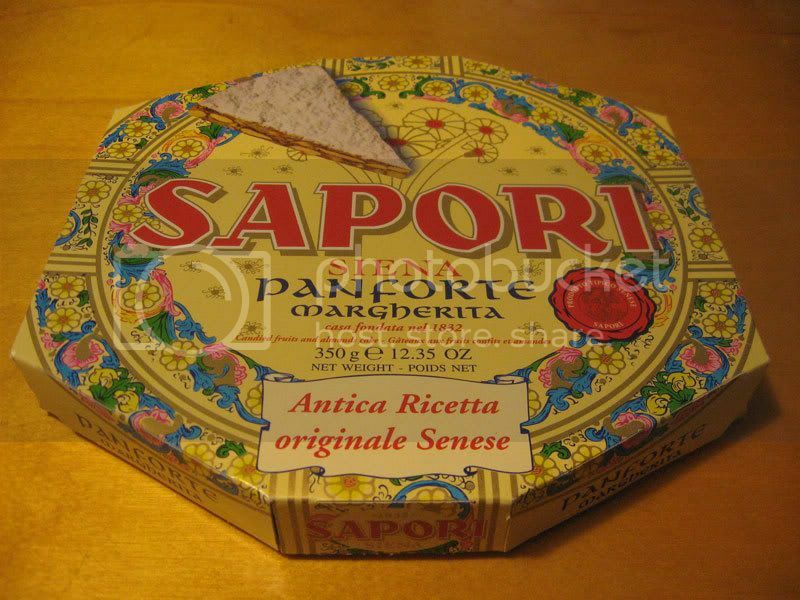 A panforte was ordered from Amazon to have for dessert on Christmas. 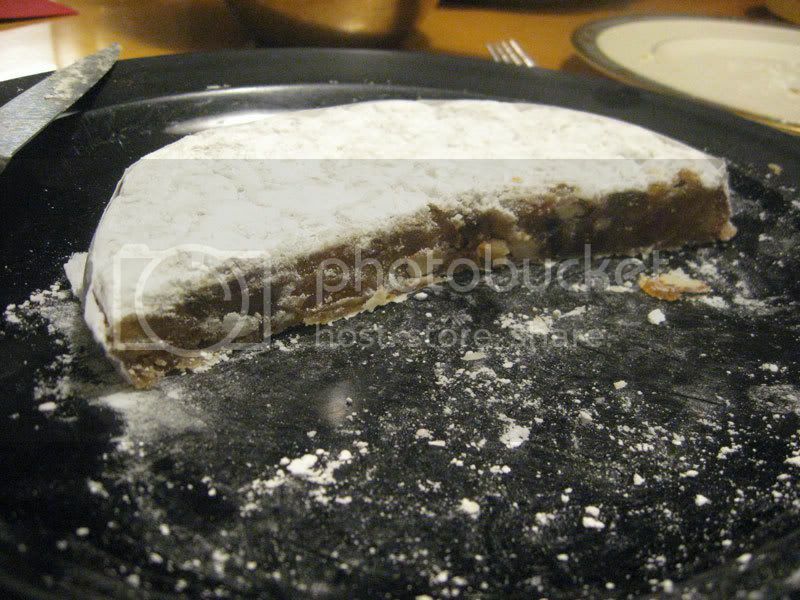 The panforte was a type of very dense cake filled with dried fruit and nuts, topped with powdered sugar. It actually was more like a candy rather than a cake, but it was a very unique dessert. 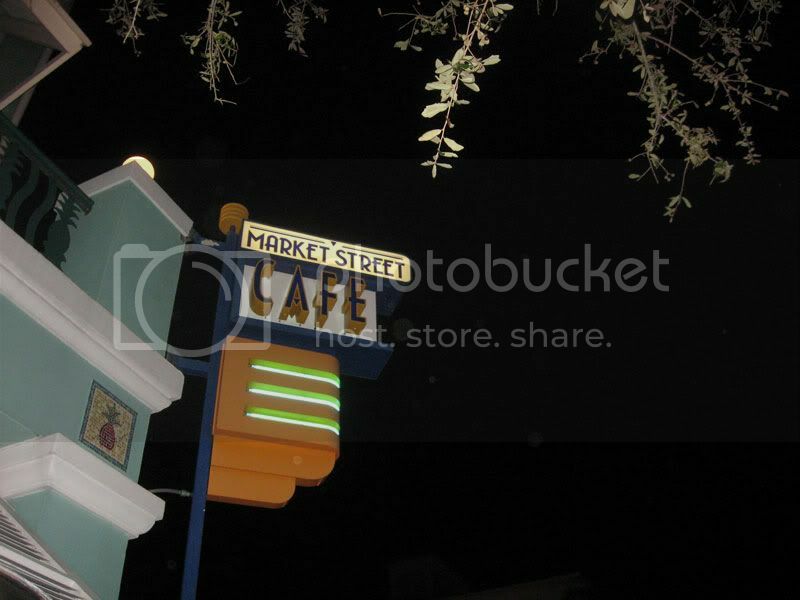 I ate Fish Tacos from the Market Street Cafe in Celebration, FL. 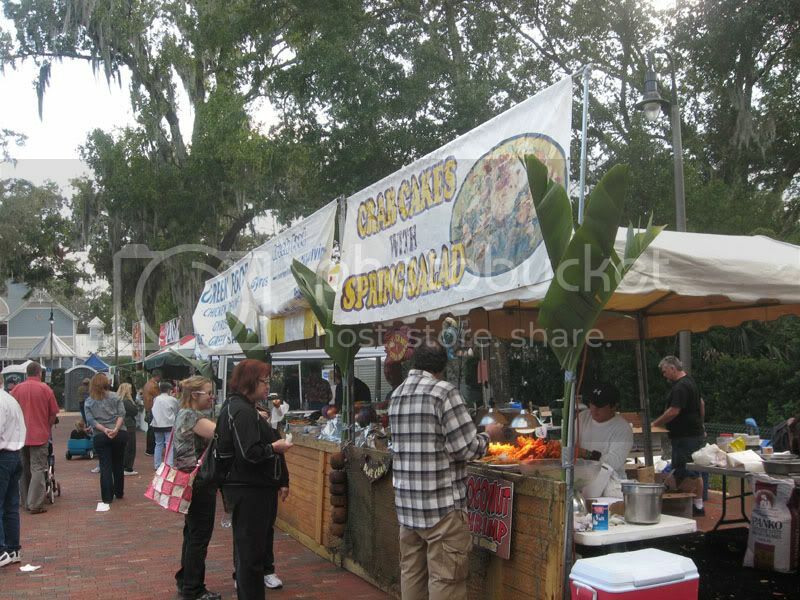 Celebration was the planned community created by Disney and the Market Street Cafe is one of the original restaurants in the city. 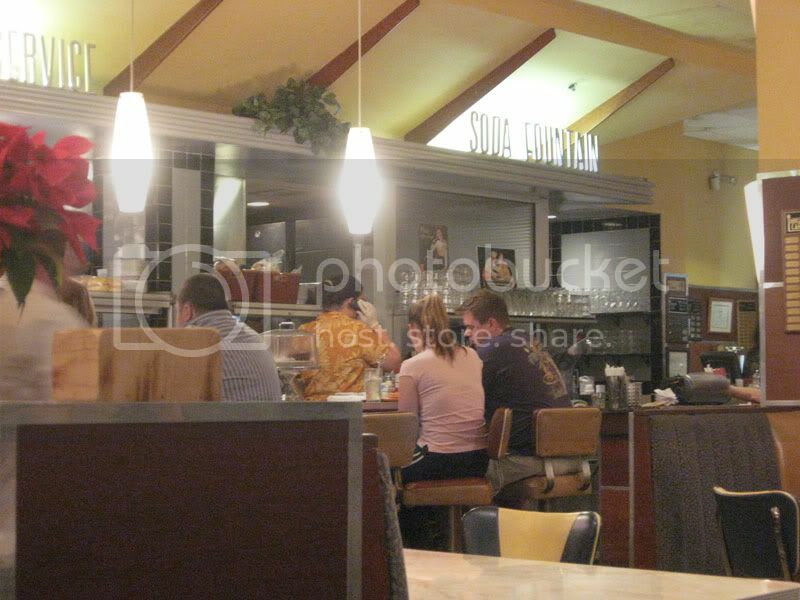 The restaurant has the whole classic diner look going on (as seen by the picture below), and they seem to try to have the appropriate food. I really don't know how appropriate tacos are for diner food, but they were still good. My fish tacos were good. 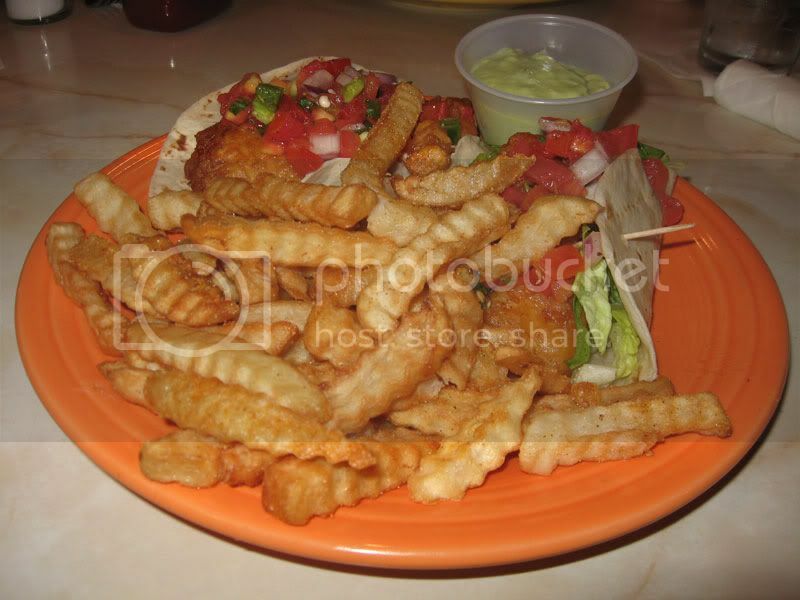 They consisted of fried cod, lettuce, and salsa wrapped in tortillas, and were served with an avocado tarter sauce and fries. My only complaint was that the French fries were kind of soggy, and didn't exactly seem freshly cooked. 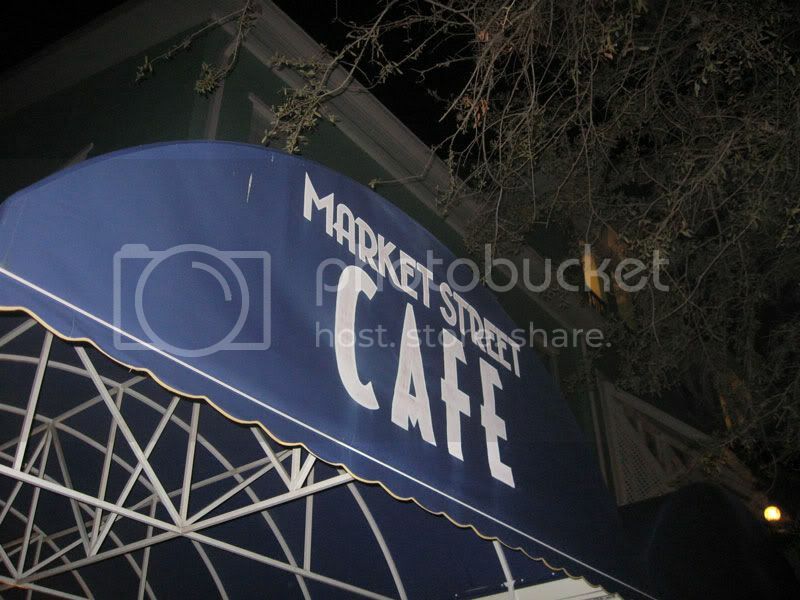 Otherwise, my Market Street Cafe Fish Tacos were tasty. 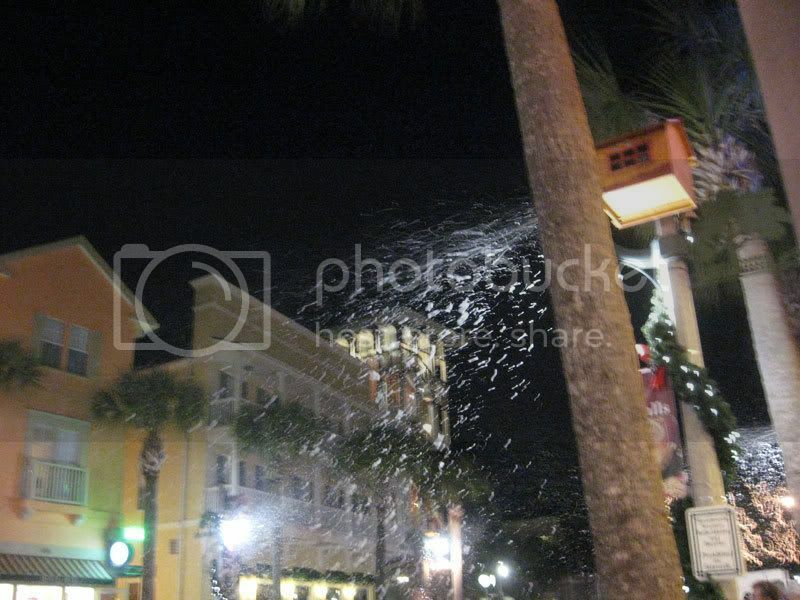 Here's a video of the fake snow in Downtown Celebration followed by a house with Christmas lights synchronized to music from Epcot's Illuminations. 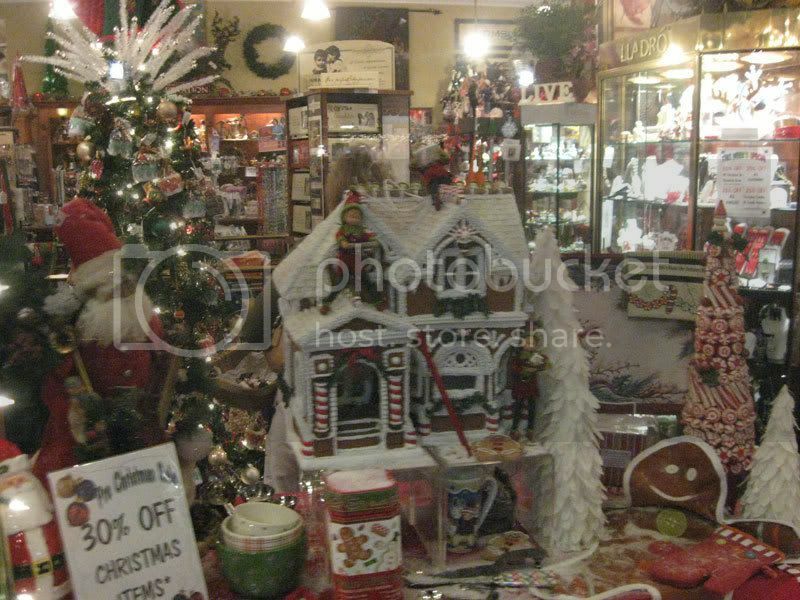 As for something else food related in Celebration, I took a picture of this large ginger bread house in a store window. Casa Del-Dio in Fern Park, FL used to always win Best Pizza in Orlando in the local papers. 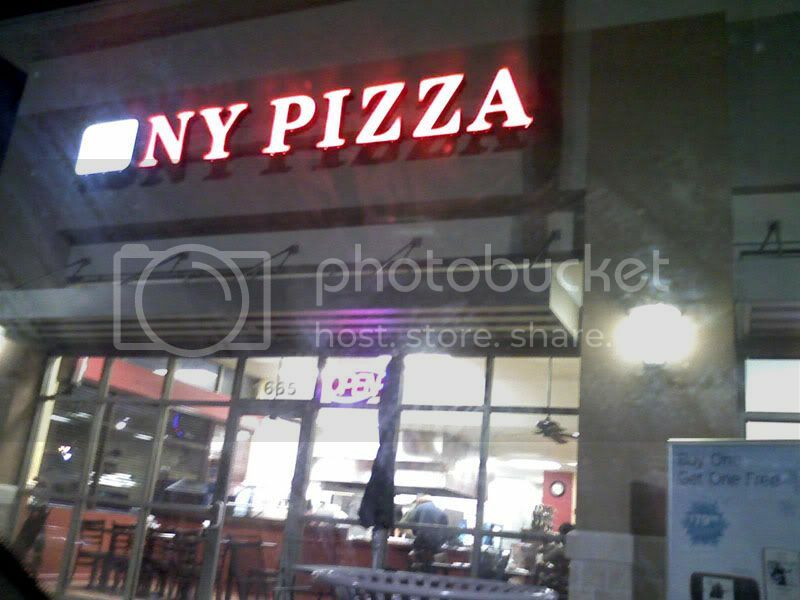 I ate at the restaurant back then, and the pizza was good. Then for some reason, I thought Casa Del-Dio went out of business. I tried going to the restaurant a few times, and they were always closed. I recently drove by, and they were open again, so I gave them a try. 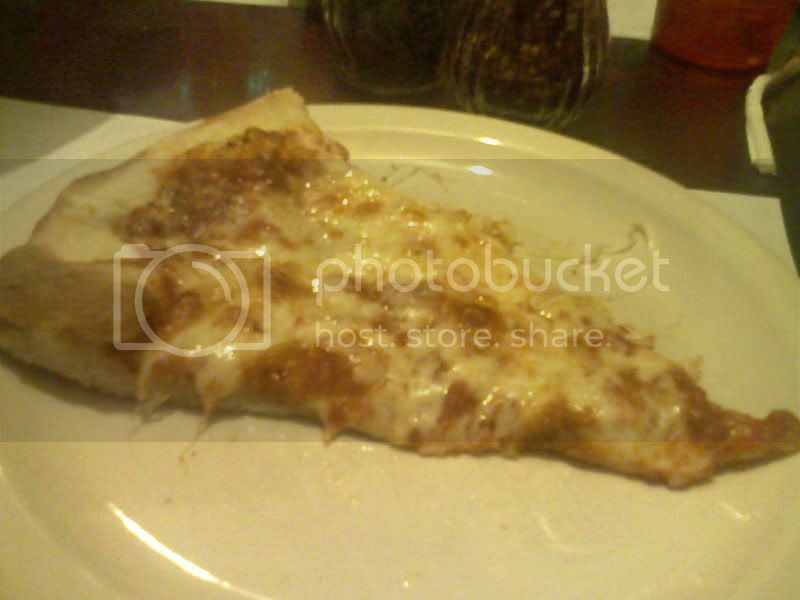 We had a large cheese pizza and some garlic bread. The garlic bread was garlic-less. They put garlic butter/powder on the bread instead of actual garlic. That's never a good thing. The pizza tasted okay, but it was overloaded with cheese. 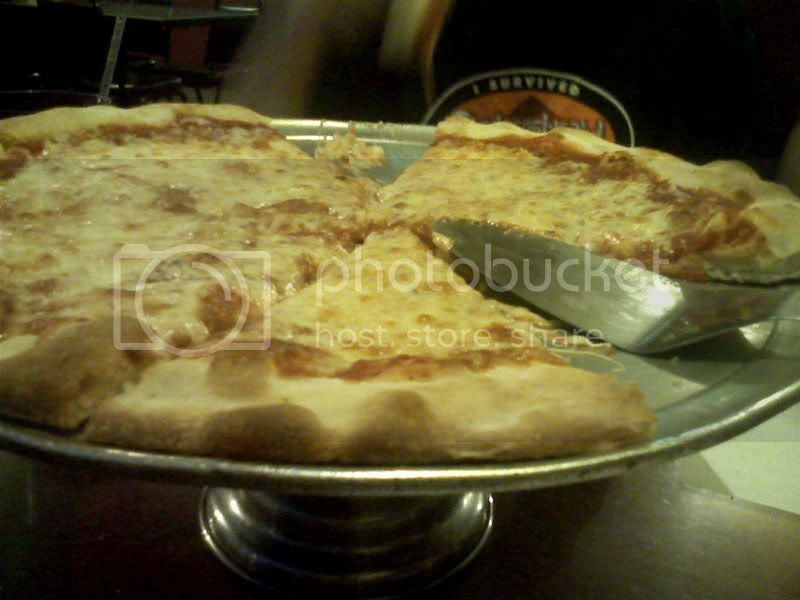 The cheese was way too much and out of proportion compared to the rest of the pizza. The overload of cheese kind of ruined what seemed to be a pretty good pizza otherwise. 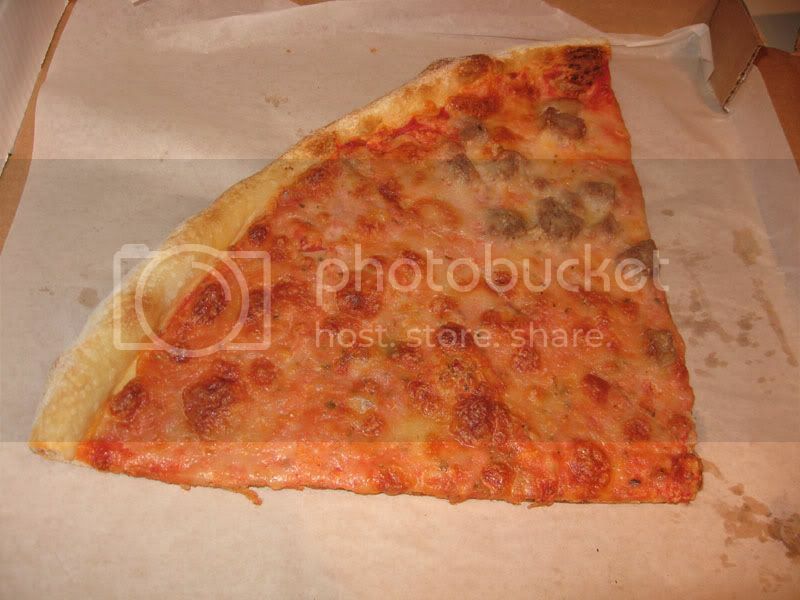 I never like it when there is more cheese than the pizza can handle, and it all overflows onto the plate while there is still plenty of cheese on the slice. 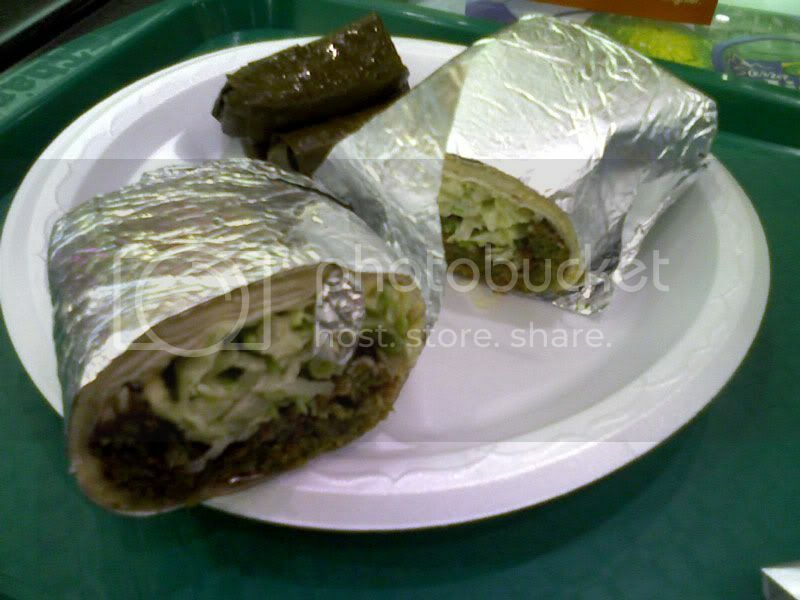 I ate a falafel pita from the Hovan in the Altamonte Mall Food Court. 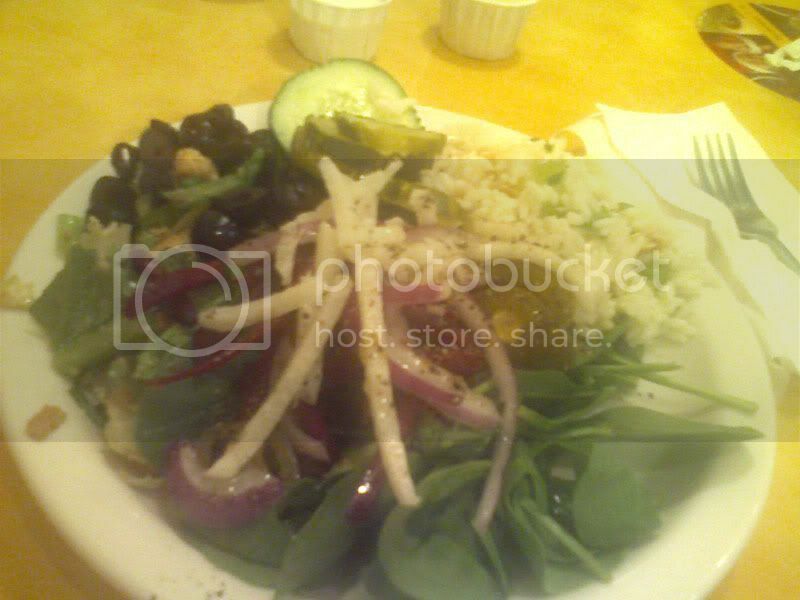 It was filled with falafel, hummus, lettuce, and tomato and was served with a side of stuffed grape leaves. The falafel pita tasted good enough, but I've had much better. For example, as far as fast food Middle Eastern food goes, I liked my falafel from Mrs. Fields Cookies at UCF a whole lot better than this one from Hovan. One of the major issues that I had with Hovan wasn't necessary about the taste, but rather how the pita was wrapped. 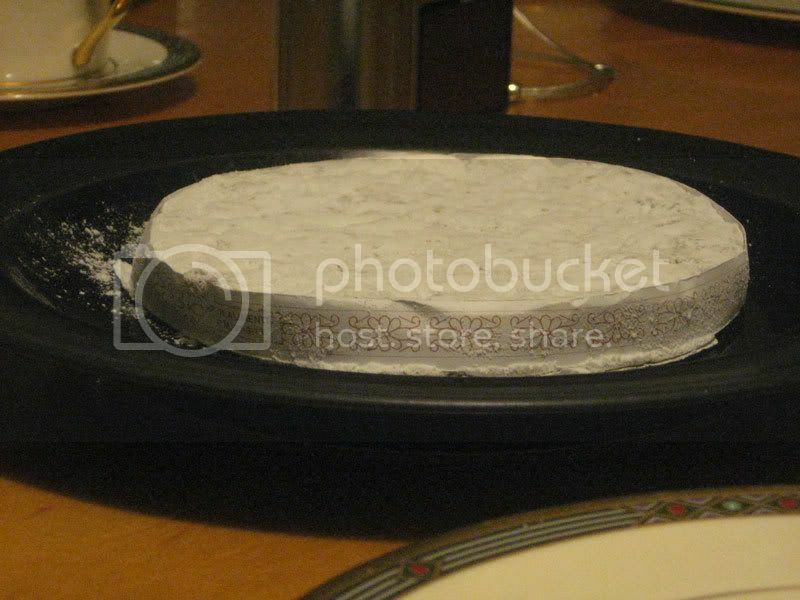 The pita was wrapped in aluminum foil, and then was cut in half. This left little shards of aluminum in the sandwich that I had to constantly pick out. The grape leaves left a lot to be desired though. They tasted very bland and the rice mixture inside was very mushy. 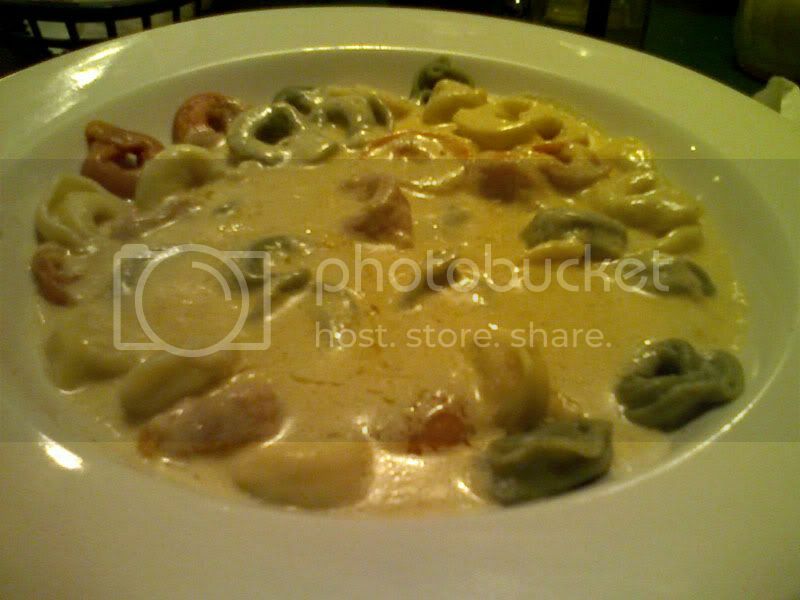 I ate Pasta with Vegetables at Patio Grill in Longwood, FL. 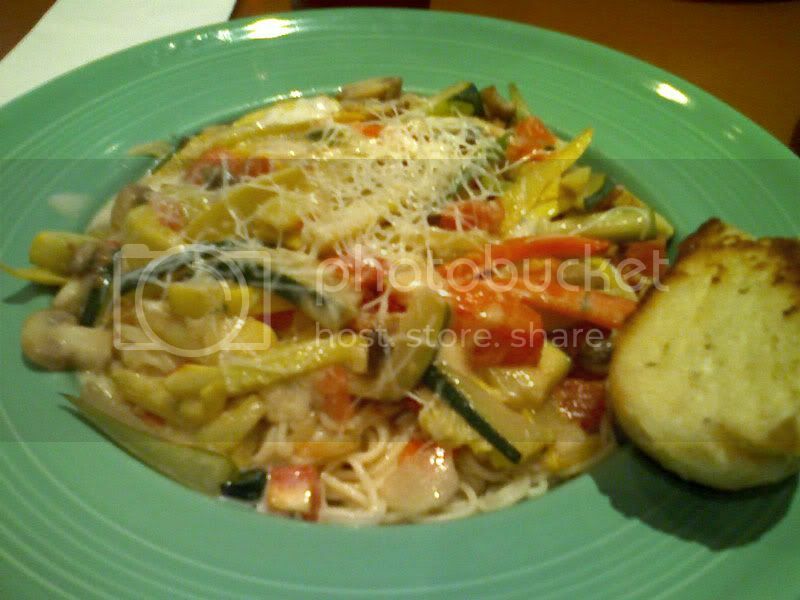 The dish consisted of angel hair pasta, topped with carrots, zucchini, onions, yellow squash, mushrooms, and some cheese. It also came with a piece of garlic bread. When I ordered, the menu didn't list the vegetables that came on the pasta, and I really would have preferred for the mushrooms to be left out (mushrooms aren't even vegetables, they're fungus). 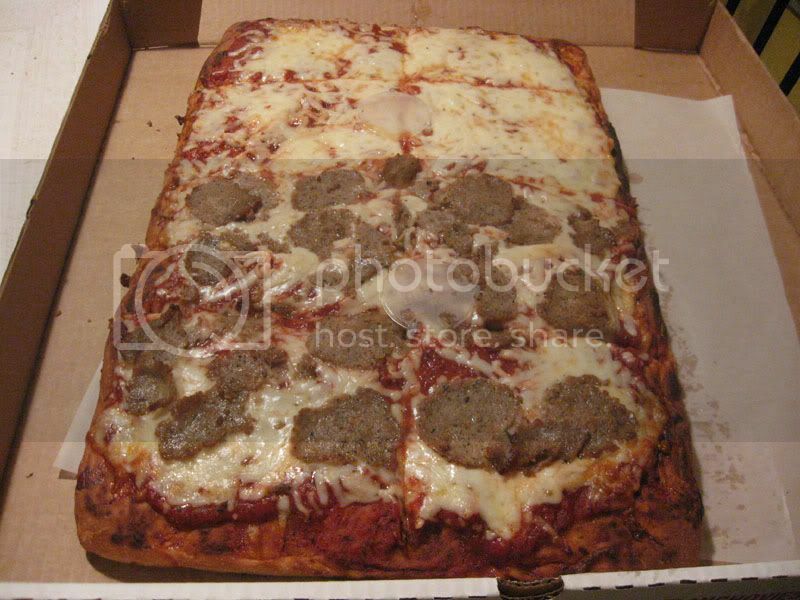 I had a strange craving for Sicilian Pizza. I normally don't like Sicilian pizza all that much, and it seems I'm almost always disappointed with Sicilians whenever I get them. It had been years since I ate a Sicilian pizza, and I don't think I've ever eaten one in Florida (as I was looking through my pizza menus of local restaurants, it seemed most places don't even make Sicilian). To prove to myself that I still don't like Sicilian pizza, I ordered a pie from Dalli's pizza in Lake Mary, FL. I picked up the half cheese/half meatball pizza and took it home. I ate the cheese slices, and it wasn't too bad. 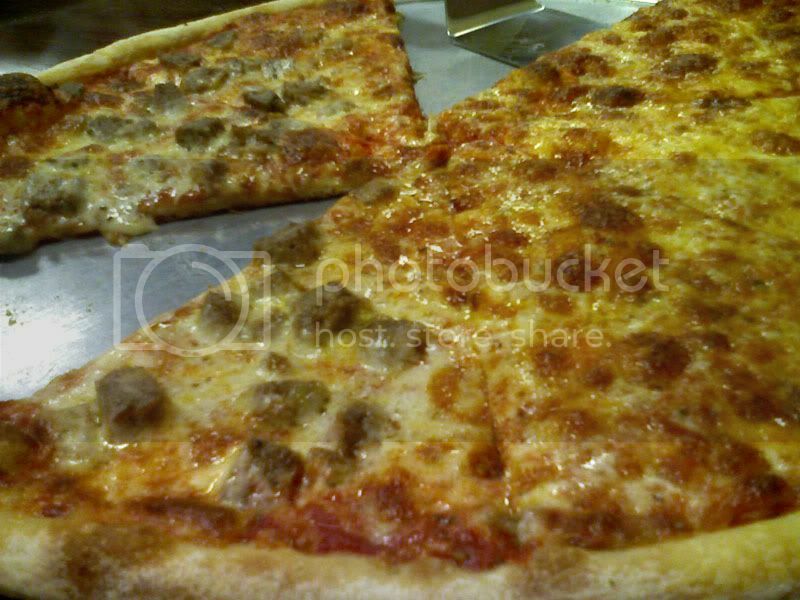 I would take a traditional slice of pizza from Dalli's over a Sicilian slice, but it was still acceptable. I think my problem with Sicilian pizzas is that there is too much of everything. There is way too much of the chewy crust, and because of all of the crust, there's more sauce and cheese than you get on a normal pizza. It all seems like a bit of overkill in my opinion, and I'd much rather have a traditional thin slice of pizza where there isn't huge amounts of all of the pizza components. Sicilian pizza was better than I remembered, but I think I'll stick with traditional pizza until I get another Sicilian craving, whenever that will be. 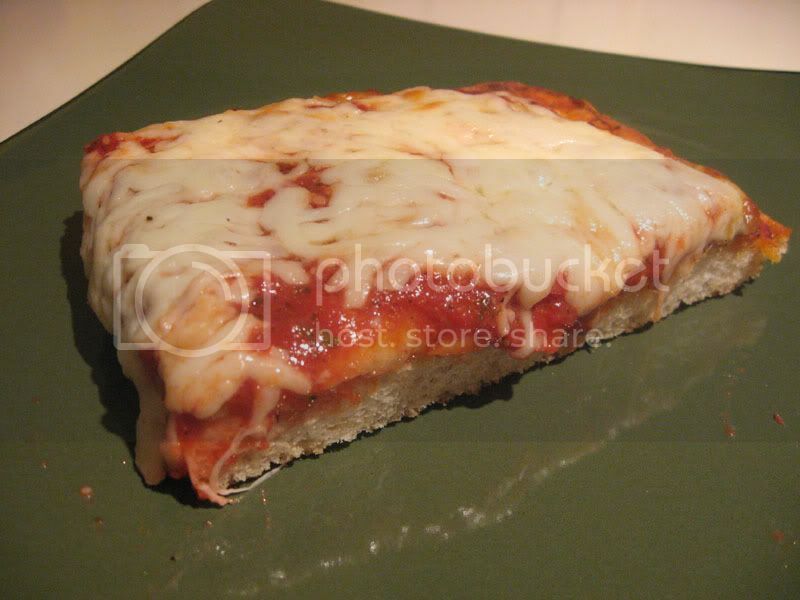 One last observation I had was that while normal pizza tastes good cold out of the refrigerator the next day, Sicilian pizza tastes horrible like this. I couldn't eat the leftovers cold and had to heat it up. Last time I ate at Bayridge Sushi in Longwood, FL, I ate their Salmon Lunch Bento Box. I returned to the restaurant, and this time I ordered a Shrimp Tempura Lunch Bento Box. 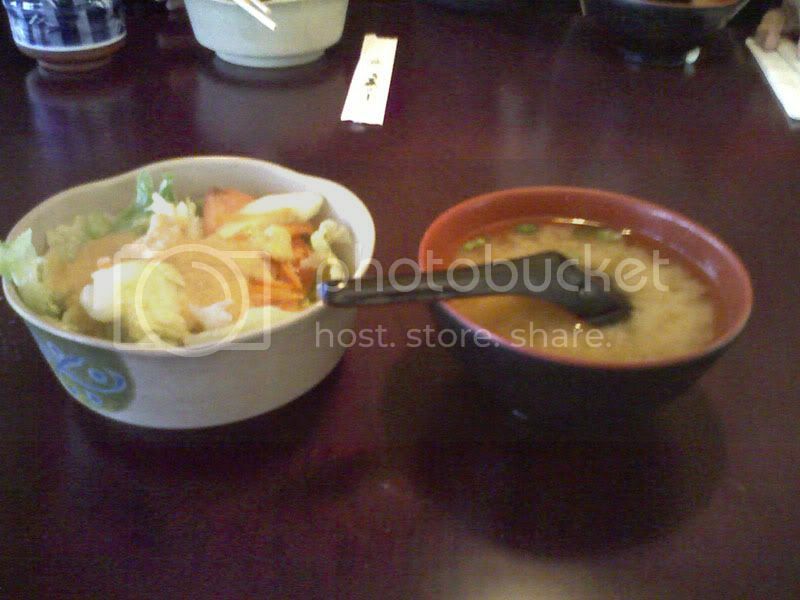 Miso soup and salad came out first, both of which were good. 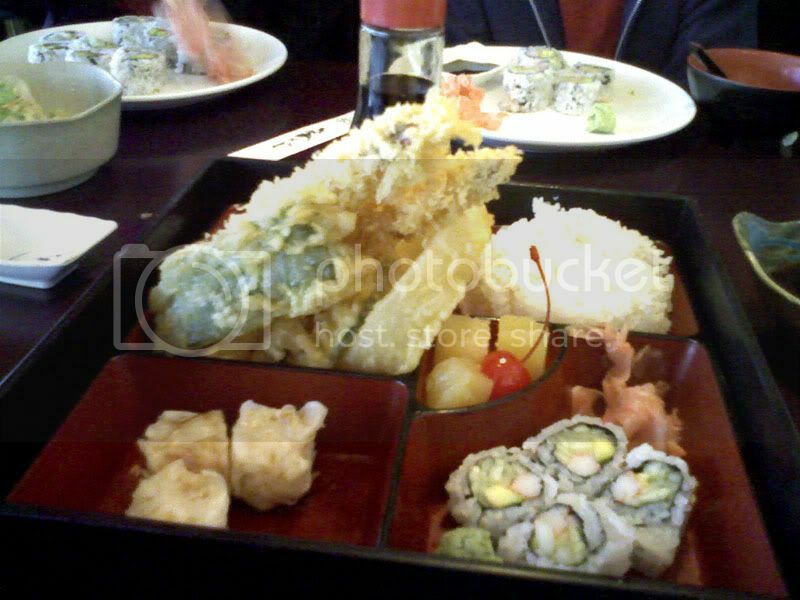 The box soon followed and consisted of shrimp and vegetables fried in tempura batter, California Roll, dumplings, rice, pineapple chunks, and a maraschino cherry. The tempura itself tasted okay, but I don't eat deep fried food that often, so fried taste got to be a bit much by the time I finished the shrimp and vegetables. Deep fried broccoli is a bit strange to me though. It kind of defeats the purpose by taking something healthy and sending it to the other side of the healthy spectrum. There is a Mrs. Fields & Pretzel Time store connected to one another in the UCF Student Union. I was going to get some sushi, but then noticed that along with the cookies and pretzels, this store also sold Middle Eastern food. It was a very strange combination, and I doubt it's approved by corporate, but it was definitely a combination that I liked. Not too many places in the Orlando area have a good falafel sandwich, and this one was pretty good. 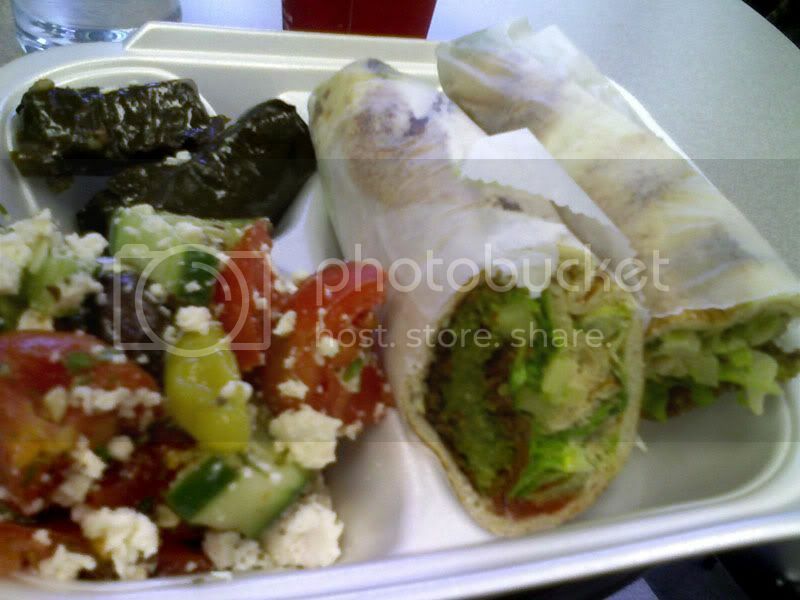 I had the falafel pita with a side Greek Salad and stuffed Grape Leaves. 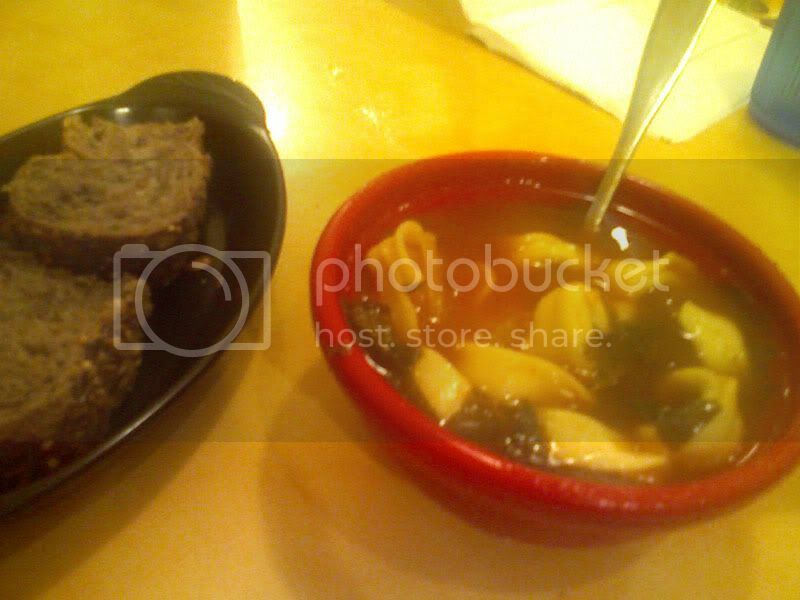 And here is some tortellini soup that tasted pretty good. I ate a Spicy Roll from the Sushi department at Publix in Lake Mary, FL. 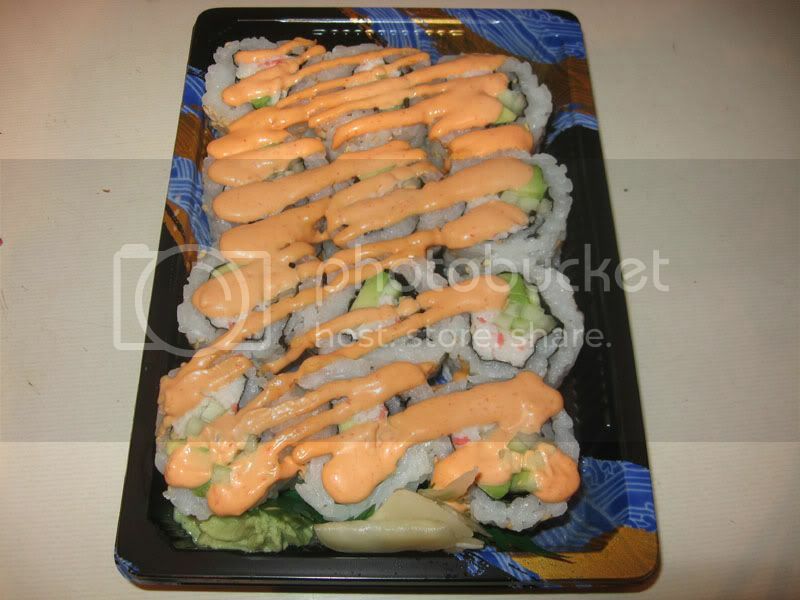 The roll was pretty similiar to the Tsunami Roll, but was filled with krab instead of shrimp salad. I think this sauce was spicier than the sauce on the Tsunami roll as well. 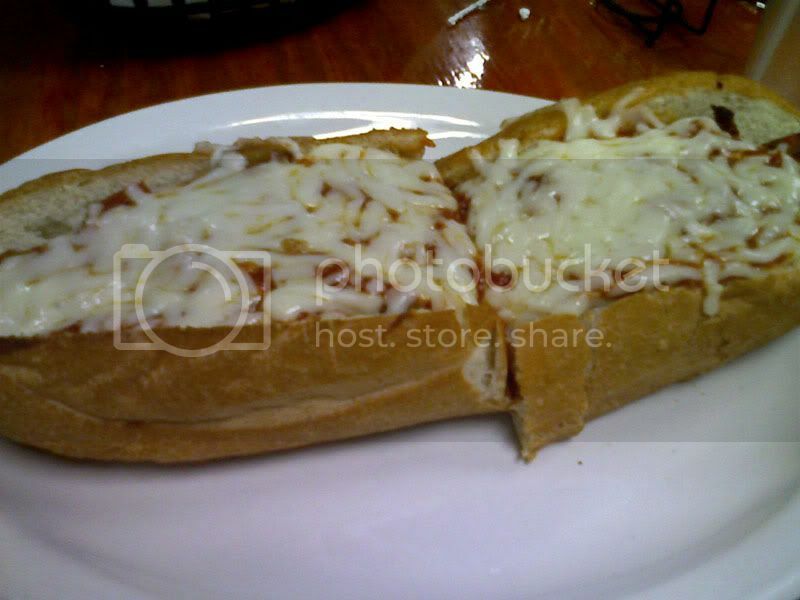 I ate an Eggplant Parmigiana sub from Dalli's Pizza in Lake Mary, FL. 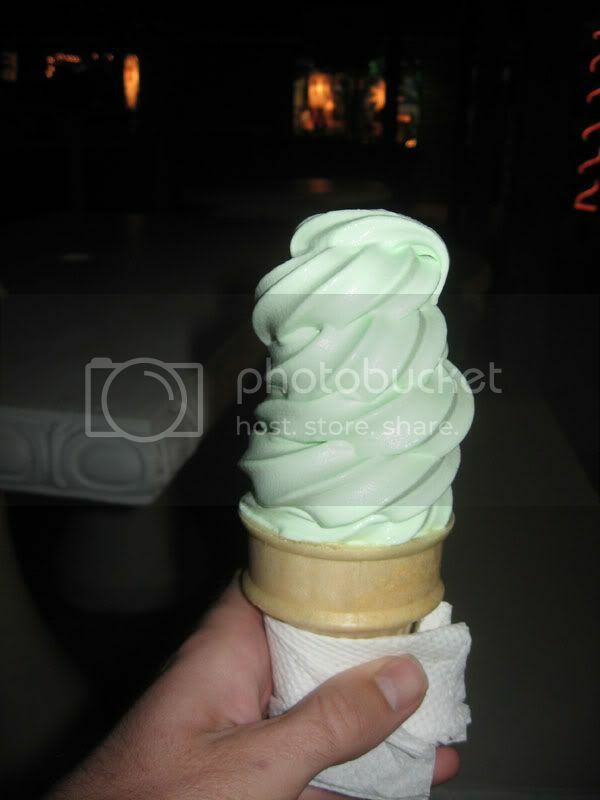 I've eaten these before, and since I got it again, you know it must be good. 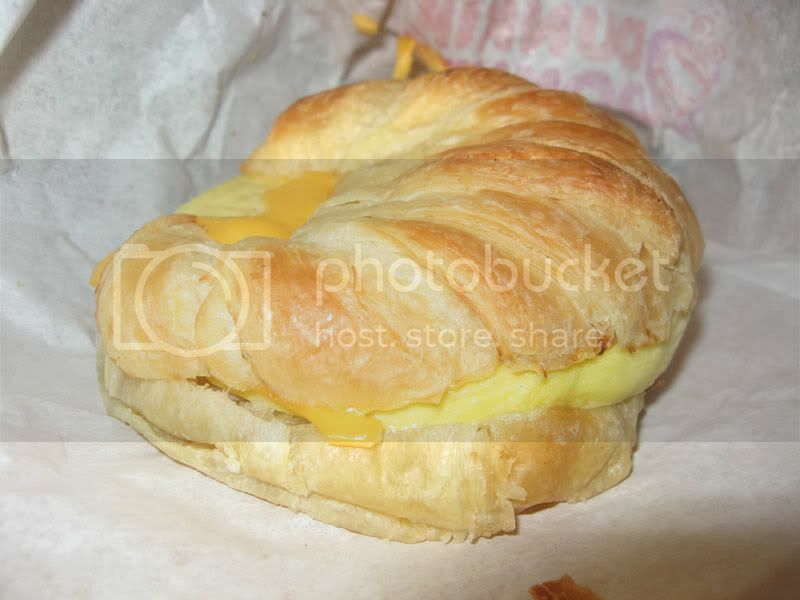 On a visit to the Dunkin Donuts in Longwood, FL, someone bought me an Egg & Cheese Croissant. I'm not a big egg person, and I would have preferred another type of cheese than the American Cheese that was on the sandwich. 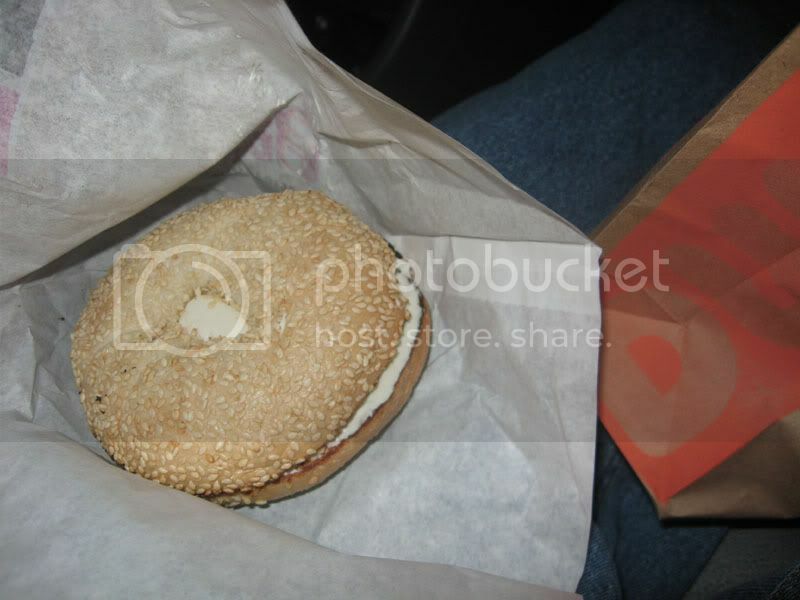 I ate it anyway, but I would have preferred a bagel. I ate at the new Caffe' Positano in the Super Target shopping center in Sanford, FL. The restaurant is a few stores down from the Yokohama Japanese Restaurant in the space formerly occupied by Vivona's. Vivona's was a good Italian restaurant for a while, but when they opened this location, the Vivona's started going downhill. 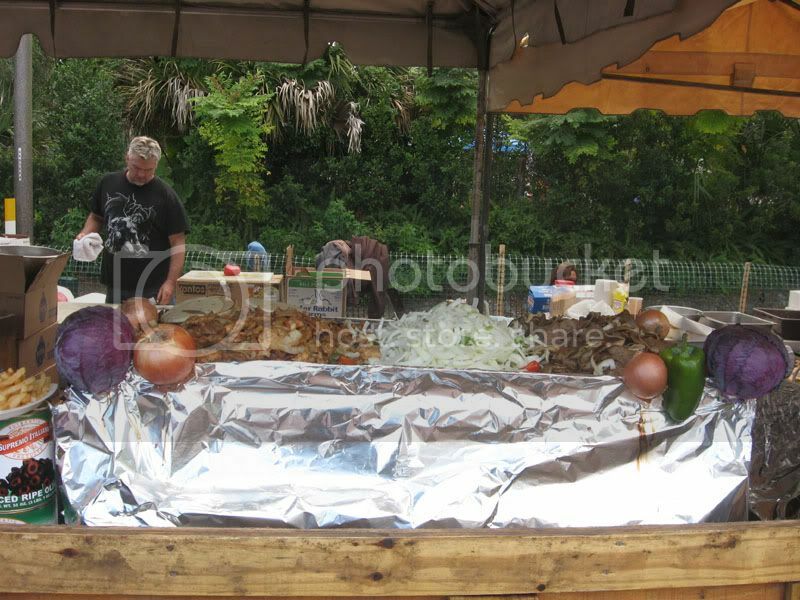 It seemed the quality and portions of the food went way down and the price increased. Towards the end, the Vivona's employees acted like the customers were an annoyance, and the service was horrible. 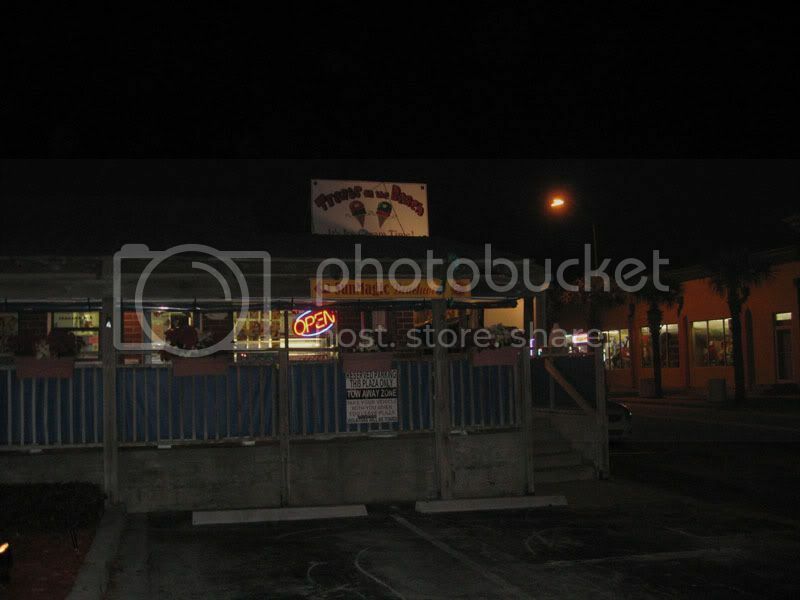 The last time I went to this Vivona's location, the whole place smelled like rotting meat, and then a few weeks later, both of the Vivona's were closed. There is still one Vivona's left on Park Ave. in Sanford with different owners. After Vivona's closed, Caffe' Positano opened in their place a few months later. I ate there a week or two after they originally opened, and the restaurant is pretty much unchanged from when Vivona's was there. 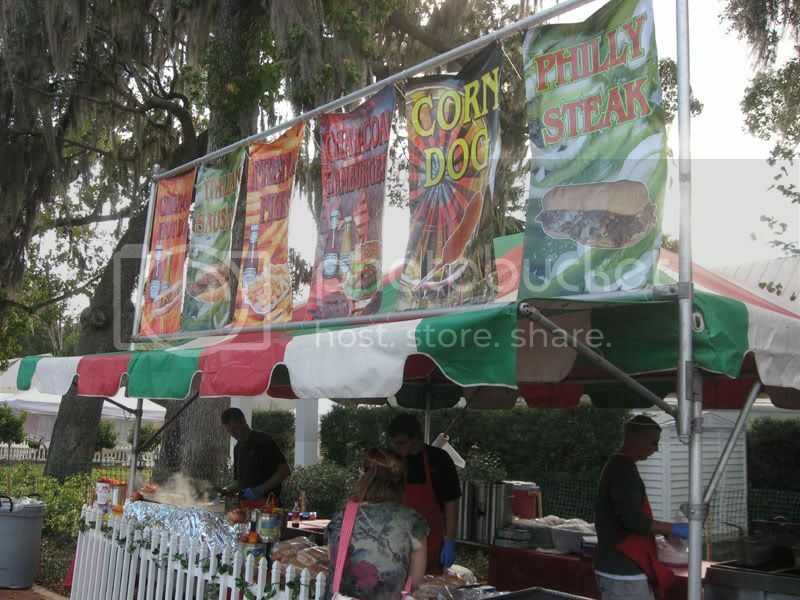 Unlike the Caffe' Positano in Apopka, this one seems to be geared more towards take out. I ate in the restaurant anyway, and ordered a pizza and garlic knots. 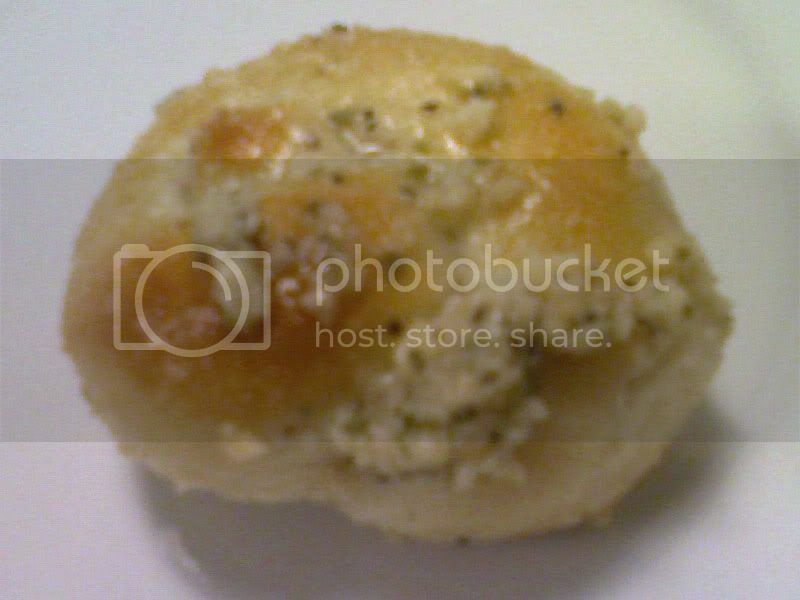 The garlic knots came out first, and had plenty of garlic on them. They weren't served with a side of tomato sauce like most Italian restaurants give with their knots, but I never use the sauce anyway. The pizza came out soon enough. 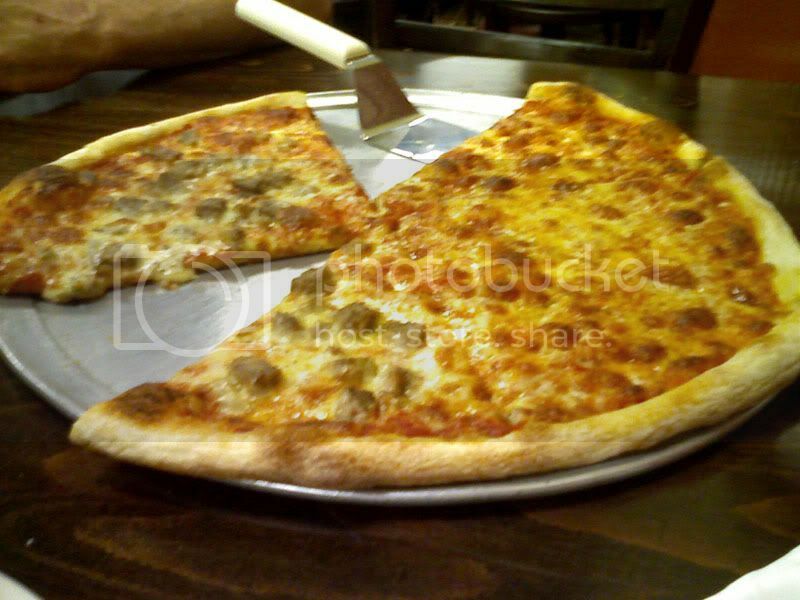 We ordered an eighteen inch pizza topped with half meatball. The first thing that I noticed was the the meatballs were cubed instead of sliced. I had the cheese half of the pizza so I won't comment on the taste of the meatballs, but cubed meatballs remind me a bit of how meatballs are served at places like Pizza Hut and Papa Johns. As for the cheese half of the pizza, it was a pretty good pie, with the exception of two complaints. The first being that the crust was a bit too crispy. It moved past the perfect pizza crust consistency and was too near the consistency of a cracker. My second complaint was that it sort of tasted like their oven needed to be cleaned. The pizza had a burnt charcoal-like taste that pizzas sometimes get if they are cooked on an oven that's due for a cleaning. Otherwise, it was a pretty good pizza. I would put this pizza a step above the pizza that Vivona's served while they were in their prime. The next day I had some of the leftover pizza, and the moisture in the refrigerator softened the crispy crust a bit. It turned the pizza that was too crispy into a pizza with the perfect crust consistency. It's amazing how sometimes pizza improves the next day out of the refrigerator. In the shopping center at the intersection of Lockwood and Mitchell Hammock in Oviedo, FL, there is an Italian Restaurant called Cafe Panuzzo's. The neon lights out front attracted me to the restaurant while I was riding by, and I eventually returned to give Cafe Panuzzo's a try. I ordered Tortellini Alfredo. 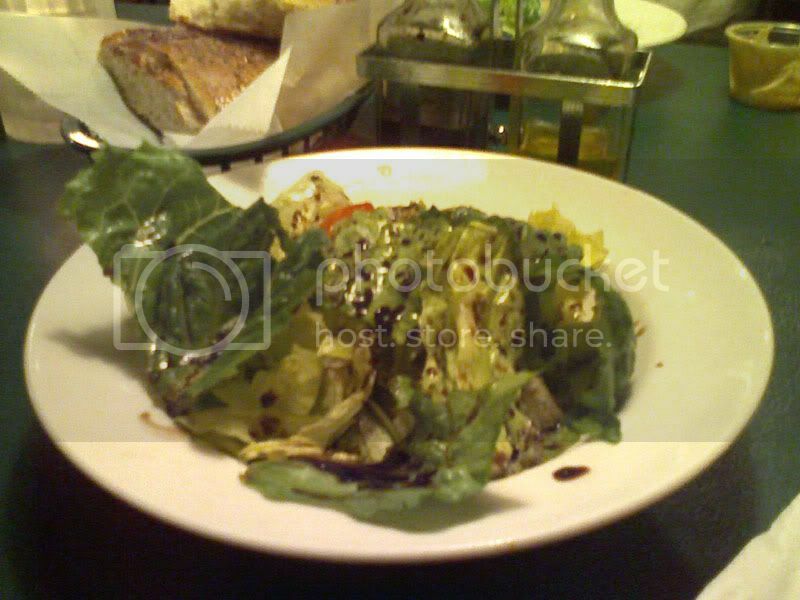 It came with a salad and bread, both of which were served before the tortellini. It was pretty good bread. The tortellini itself tasted okay, but it was a bit boring. It was basically the pasta and sauce on a plate, and that was it. Adding anything at all to break up the monotony of the pasta would have been an improvement. Sprinkling some basil leaves on top or something would have helped. The food did taste okay, but it was nothing that will have me going out of my way to return to Cafe Panuzzo's any time soon to eat more boring food. 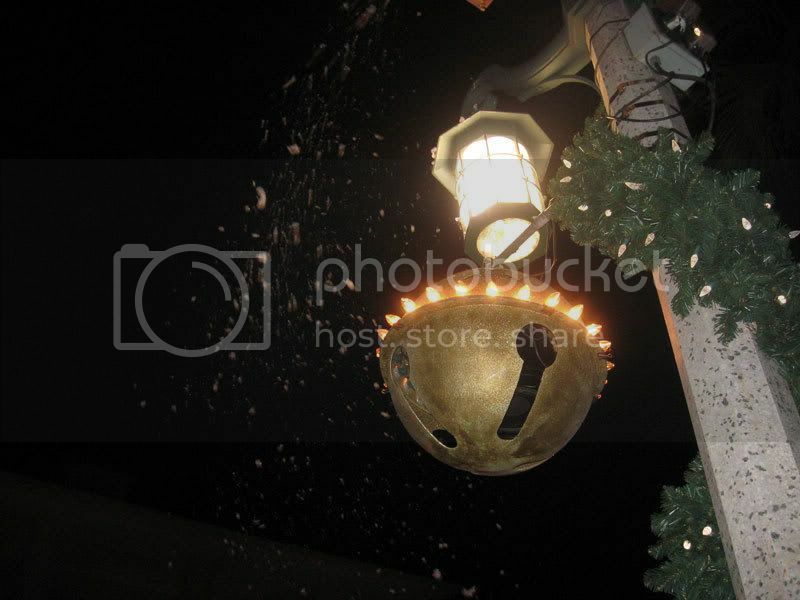 Lots of art shows/craft fairs were going on this past weekend. There's the Longwood Crafts Fair. 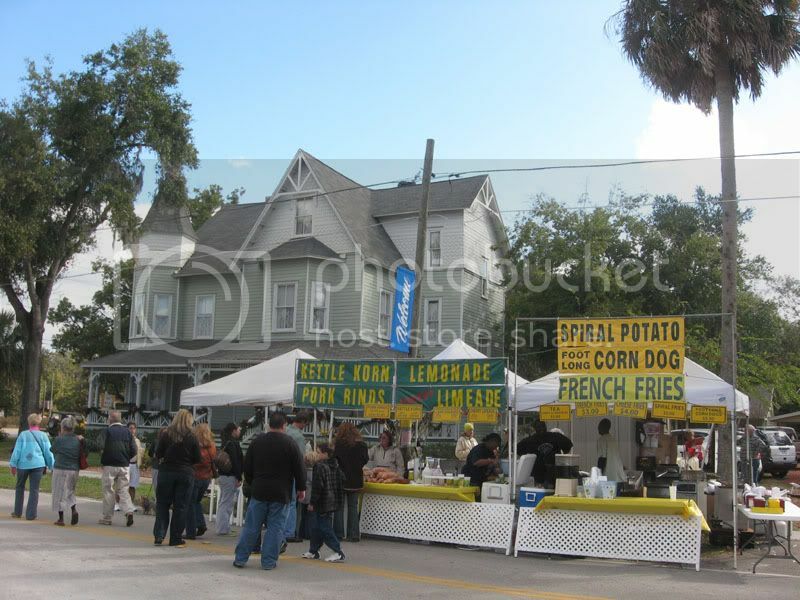 Deland had some sort of similar event, and Altamonte Springs had the Art on the Boulevard in Uptown Altamonte Festival of the Arts event. I walked around this art show the day after I walked around Longwood's event. I liked the selection of art being sold here much better than what Longwood had, but don't forget it's all about the food. I went to the Longwood Arts & Crafts Festival on November 22, 2008. It was a good time walking around Downtown Longwood, looking at the old houses and what people were trying to sell. Much of it was actual handmade arts/crafts, while a lot was also mass produced junk made in China that people were trying to pass off as their own. 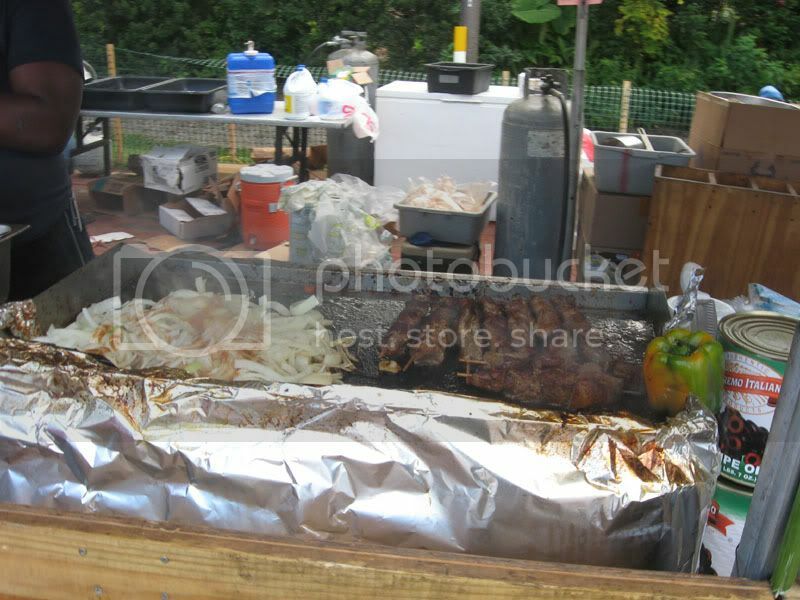 This is a food blog though, and that's why I took lots of pictures of the food stands at the festival. 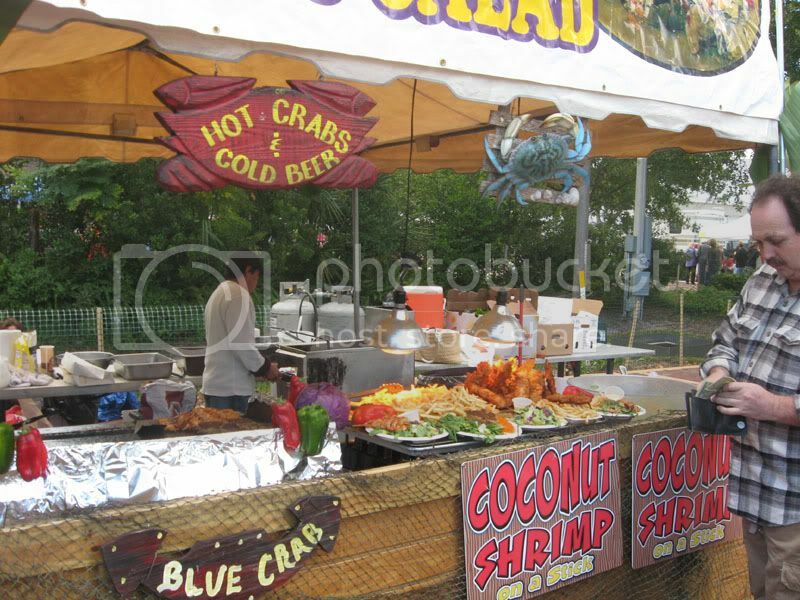 The food always seems to be very photogenic at events like this, and although my visit to the festival involved no actual eating of the food being sold, I'm posting the pictures of the food stands anyway. 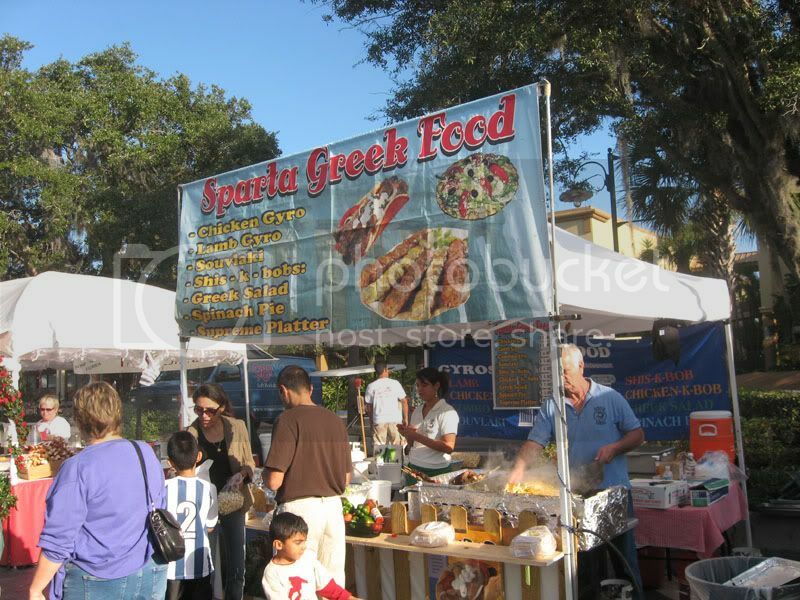 I ate a Chicken Souvlaki Pita at Athena Cafe in Altamonte Springs, FL. 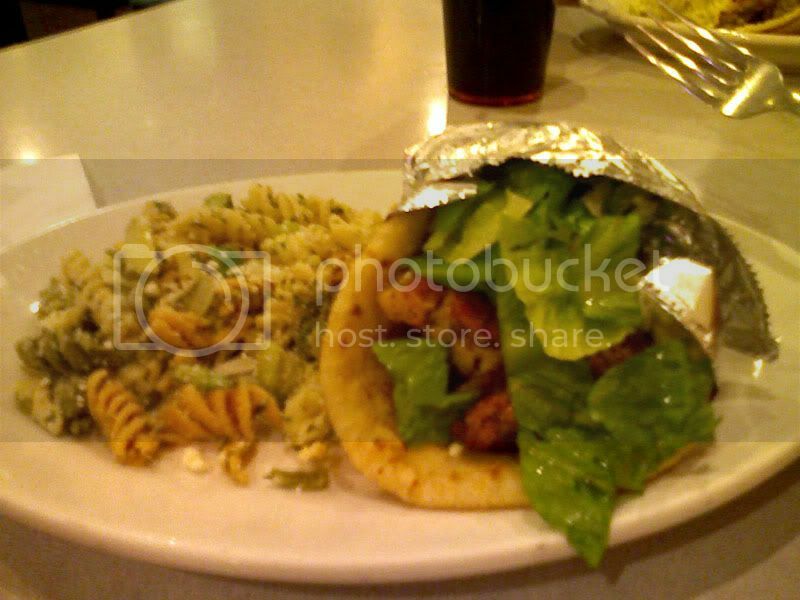 The pita was filled with very flavorful chicken, lettuce, and tzatziki. Tomatoes were also an option, but I had them left off of the sandwich. Pasta salad was served with the pita and it was all very tasty. 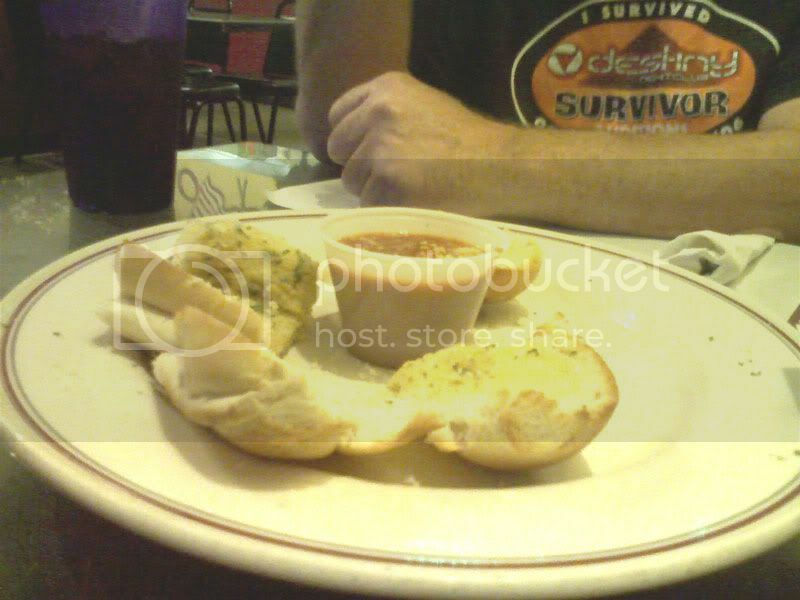 Even though the food is good, the atmosphere of the restaurant could use some improvement. Being able to watch the employees do crossword puzzles due to there being so few customers isn't a good thing.